NOT to be used as a first line of defense. Billion of dollars are spent every year on the damage these drugs cause ripping people lives apart. In December 2012, the Dannelly family posed happily for their Christmas card photo blissfully unaware that it would be their last. One month later Levaquin changed their lives forever. Chris Dannelly (beloved husband and father), came down with a bad cold and went to see a doctor over the weekend. He was diagnosed with pneumonia and was given two pills of Levaquin. Unfortunately, he had an immediate adverse reaction to the fluoroquinolone antibiotics, and began experiencing excruciating limb pain. Kathy Dannelly (Chris’s wife) took him to see their family physician the following Monday. At that time his doctor saw no sign of pneumonia, but it was too late, he had already taken two pills of Levaquin unnecessarily. The following day he had to be rushed to the emergency room at the John’s Creek, Georgia Emory location with increasing pain. They administered multiple doses of morphine to no avail…the pain never stopped. Tragically, by Wednesday Chris coded and was charged 18 times in an attempt to save his life. He went into a coma and his death was officially called the following morning on January 17, 2013 at 8:15 am. After reviewing the autopsy report, doctors stated that “all signs point to Levaquin” as being the cause of death. Mr. Dannelly was survived by his loving wife Kathy of 12.5 years, his 7 year old son, and his 4 year old daughter. The last time his children saw him alive he was crying in a wheelchair in unbearable pain. Chris was a healthy, active man in the prime of his life. He worked out five days per week, and enjoyed playing both indoor and outdoor soccer regularly. Within a matter of less than a week’s time he went from being perfectly healthy, to losing his life…all because he took two little pills of Levaquin. Kathy Dannelly, has courageously decided to share her husband’s story in an attempt to educate the public about the risks involved with taking fluoroquinolone antibiotics. She feels that their family’s happily ever after was stolen from them, and she doesn’t want to see this happen to any other families. Media sources may reach Mrs. Dannelly at katdan05@bellsouth.net . We would like to express our condolences to Kathy and their precious children. We are so very sorry for your loss. Please know that your efforts to raise awareness are greatly appreciated, and that what happened to your husband will not be forgotten. May he rest in peace. I have never allowed myself to read this one, until now. So tragic! I am truly grateful that I am slowly recovering from an adverse reaction to Cipro after only taking 3 pills. I’ve heard that Levaquin is like Cipro on steroids. I’m so sorry for your unnecessary loss and I hope that good will come out of this. Seems like all these people were seeking some sort of pain meds am I the only who sees that? If morphine does not work on you chances are that you are a drug addict. I find it hard believe that only 2 or 3 pills of an antibiotic could kill someone. Also they can still not even prove fybromialga is really even real. Mostly pill heads excuse for getting meds? I had a procedure and started running a fever and I took 2 levaquin a day and did not end up getting sick. I did this for 7 days and I had zero side effects. So maybe it saved me. Wow… you are horribly callous and insensitive… probably worse but I’ll refrain. 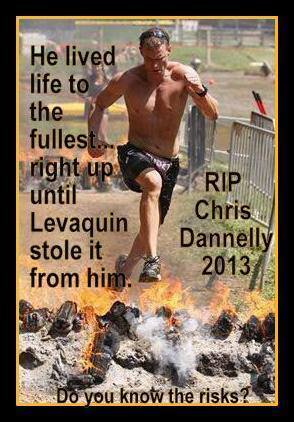 There is NO REASON TO BELIEVE that Chris Dannelly was a drug addict. He was a good man and a good father. He was a cancer survivor and an athlete. The fact that you did not die from Levaquin does not mean that others don’t suffer from adverse effects of levaquin – including death. Your comments about people with fibromyalgia just reinforce that you a horrible person. Edit – sorry for calling you a horrible person. Callous remarks on a story about a tragic death make me a bit angry. I probably could have been a bit more gentle in my response. As a nurse and someone who took Levaquin, I can tell you for a fact that Levaquin can have MANY side effects, including muscle cramps, pain and other varied side effects. Count yourself fortunate that you did not have any side effects. I took two doses and refused to take any more. I developed tachycardia ( fast heart rate, so much to my heart rate went up to 140, normal for me being 60). I did my own research and found this was a side effect. Everyone who asks for pain medicines are not drug seekers. There are people who have severe pain, such as people dying from cancer that morphine doesn’t help. Wow, Sarah….such incredible, naive ignorance. May you, nor your family ever have to deal with the ramifications of ANY debilitation. Your view on life just proves that you’ve never dealt with any tragedy…..and my wish for you is to remain in such ignorance. I am just now reading your comment and am glad I did not see this prior. As the holidays approach the loss of my husband hurts even more and I guess you will never understand. HOW DARE YOU REFER TO MY HUSBAND AS A DRUG ADDICT!!!!!! Shame on you and your comments.There is so much more I can but won’t say. I pray for people like you who have not a clue about the effects of this drug. I would never wish this pain on my worst enemy. Sometimes people need to think before they speak!! The person who said he was a drug addict only saw “morphine” and did not read that it was only after he was in horrorible pain caused BY the levaquin that he was given the morphine….people don’t read the whole story! So sorry for your loss that is so sad that they won’t tell us the true possibilities of a medicine they just causally hand someone. I knew Chris Dannelly. His family attends our church and we have kids in the same class at school. A health nut, not on pain meds of any type. Very physically fit. May this man rest in peace and his family find justice for their loss. Why am I recovering while another died? Why are these drugs even given out at all? 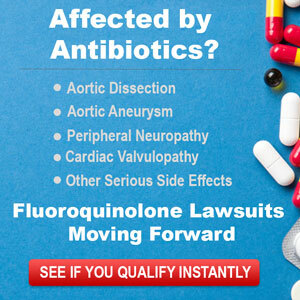 If you’re not aware of the risk of Fluoroquinolone antibiotics please please learn and keep you and your loved ones safe. I was prescribed Levo for a bad cold. I have COPD and am high risk for colds and flu. I took 1 pill and the next day I could hardly walk! It felt like my hamstrings had been shortened about 3 inches. I also ached very bad for days. For some reason my gut told me it was from the antibiotic and didn’t take any more. Wow, I’m so glad I didn’t. I’m so sorry to hear about Chris. I do think this drug should be banned, it’s not worth the risk. I have chronic lung disease, which is like having bronchitis all of the time. I have taken many antibiotics all of my life. I was administered Levaquin when it was new and it is the ONLY antibiotic that I had an allergic reaction to. In addition to having an allergic reaction during that hospital stay I had a arythmia attack and had to be placed in ICU to have my heart stopped. I was not aware this is a side effect of Levaquin. I was told that it was probably from my breathing treatments. Levaquin is still be praised by doctors. Every one I go to including ER doctors say too bad you can’t take Levaquin, it is a good drug for respiratory infections. I am so sorry for your loss and I will tell my family and friends to avoid this drug.